The latest Android OS distribution numbers have been made available from Google, and to absolutely no one’s surprise, Marshmallow has not grown by leaps or bounds. As of September, 2016, Marshmallow sits at 18.7 percent, up from last month’s 15.2 percent. For those wondering about Android 7.0 “Nougat,” given the public release has happened, it hasn’t quite hit the chart yet. Expect to see it make its first appearance next month. As for other versions of Android, Lollipop now sits at 35 percent (a slight decrease from last month), KitKat at 27.7 percent, Jelly Bean at 15.6 percent, Ice Cream Sandwich at 1.4 percent, Gingerbread at 1.5 percent, and Froyo continues to sit at 0.1 percent. 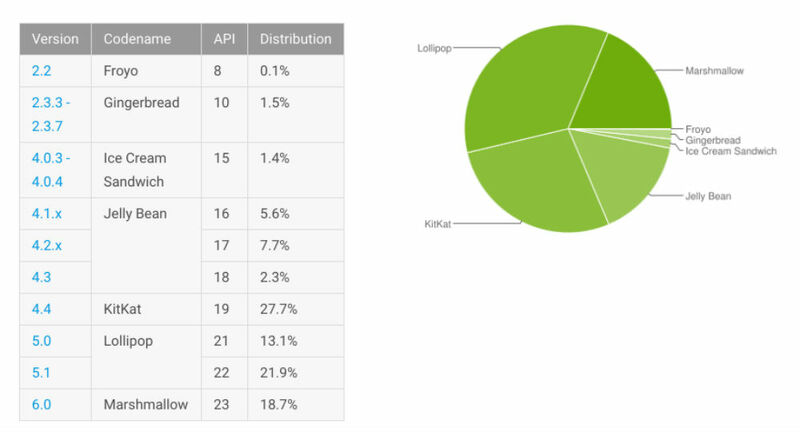 It still amazes me that there are more devices out there running Kit Kat than there are Marshmallow devices.